To estimate thermal profile for a Curing Tool. The curing tool for epoxy resin was modeled using CAD tools and thermal analysis was performed to simulate the temperature distribution throughout the cross-section. The results obtained were found suitable to perform the curing process effectively. Curing process essentially requires controlled temperatures in order to cure the adhesive material. The variation in Curing Temperature during the process may lead to decreased shear strength of the adhesive joint formed. As such, the uniformity in temperature throughout the curing process is of paramount importance. 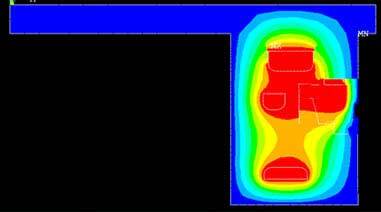 Considering the downsides associated with the physical tests, thermal simulations can be helpful in assessing the designed tool for the desired temperature distribution through FEA Techniques. A prominent heat transfer and cooling solutions provider from Canada approached Hi-Tech, for assistance in evaluating their curing tool design for uniform temperature distribution. 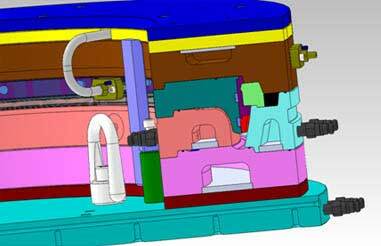 A finite element model was developed through the CAD geometry to perform axisymmetric analysis of the curing tool. Appropriate physics were applied to simulate the temperature distribution across the oil channels. The results showed that the channels were adequately designed to maintain uniform temperature across the cross-section, ensuring that the adhesive joint will possess required shear strength.